Chela Mendes is the host who interviewed me for "Da Vibe" show on Choice (Channel 39) in St.Lucia during my "Go Big or Stay Home" event. Chela credits Charlene, the other host of the show for giving her the inside scoop, since she had no idea about my event where I sold carnival jewels, eyelashes, etc. 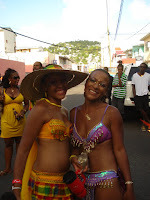 for St.Lucia Carnival 2KGreat. Chela jumped with Red Int'l in the "Traditional" section. I played with Just 4 Fun, my section was Hestia. Here I am telling her that I love her makeup! Thanks Che, next year ... same time! Love the purple, teal, jewels, and make-up on you!